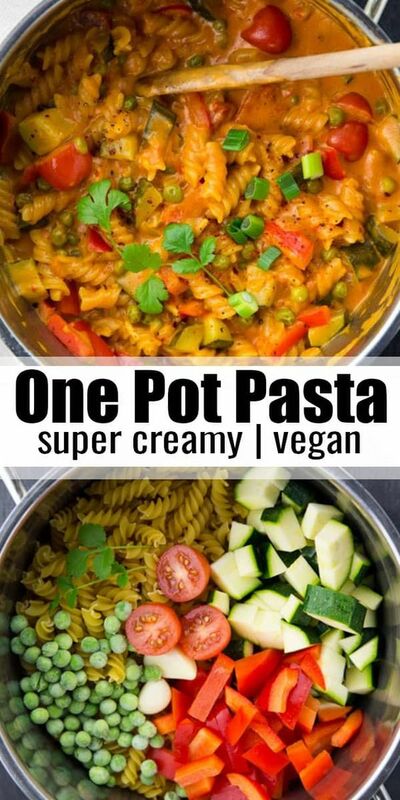 This Asian style vegan one pot pasta with coconut milk and red curry paste is my new favorite meal for weeknight dinners. Easy, healthy, and so incredibly delicious and creamy. Heat some oil in a large pot and sauté the onion for about 2-3 minutes. Then add the garlic, the zucchini, and the red bell pepper and cook for 2 more minutes. Add the remaining ingredients except for the cherry tomatoes. Cook for about 15 minutes (uncovered and on medium heat, then add the cherry tomatoes and cook for two more minutes. Season with salt and black pepper. Enjoy!